buried at Great Lakes National Cemetery. Now, more than century after serving his country on a rainy October morning his son, Brandon Township resident Ken Kengerski and Korean War veteran, scrubs clean his father’s white marble headstone. 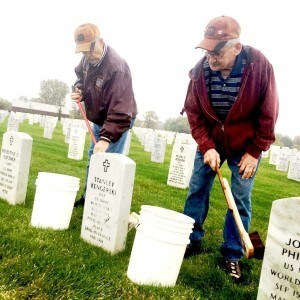 On Saturday morning Kengerski along with Ortonville VFW Commander Dennis Hoffman joined more than 800 volunteers at Great Lakes National Cemetery, Holly for the biannual headstone cleaning. The cleaning task is rather daunting, considering there are more than 40,000 headstones spread across the 500 acre cemetery. The stones are cleaned again just before Memorial Day in the spring. The fall cleaning is a prelude to the National Wreaths Across America Day on Dec. 15., where wreath-laying ceremonies at Arlington National Cemetery, as well as Great Lakes National and more than 1,400 additional locations in all 50 U.S. states, at sea and abroad are coordinated. 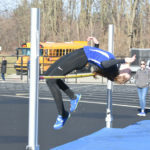 The event will be the 13th year voluteers brave the winter elements to honor the veterans., added Hoffman.